(45 pages, stapled, card cover). I have been thrilled, enthralled, inspired by science fiction since childhood. Part of that fascination lies in its language. So too the appeal of poetry for me is in the language and its special use of it. 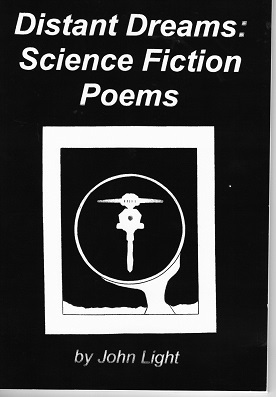 I have come to feel that poetry is the natural language of science fiction and especially of fantasy. Perhaps it was fantasy that drove the invention of poetry. Stories told in the firelight of a sheltering cave at night were unwritten; they could only be recorded in memory and the most basic tools of poetry are rhyme and rhythm, pattern and repetition. So poetry is the preferred language of memory storage. In the ancient world tales of imagined worlds and strange creatures and magical dangers were related as epic poems which still enrich our literature. When I write poems of science fiction and of fantasy I want both my ideas and my language to escape the gravitational pull of mundanity. One of the key attractions of both science fiction and mystery stories is unexpectedness and it is also one of the qualities I most appreciate in humour. As my mind wanders around my brain, from time to time it bumps into knots of verbal silliness. If these rhyme or have rhythm they become poems of a sort and some of those have worm-holed or quantum-tunnelled their way into previously empty spaces in these pages. As in the other collections in this series, the writing spans three or four decades. The poems are not arranged in order of composition (indeed some have continued to evolve). Instead they follow one another according to a logic I cannot myself fathom but which just felt intuitively apposite to me. So there may not be any value in reading them in the order they are presented!